For language learners, every book is an adventure. With their magical ability to transport us to new worlds, each story introduces exciting people, places, and ideas. 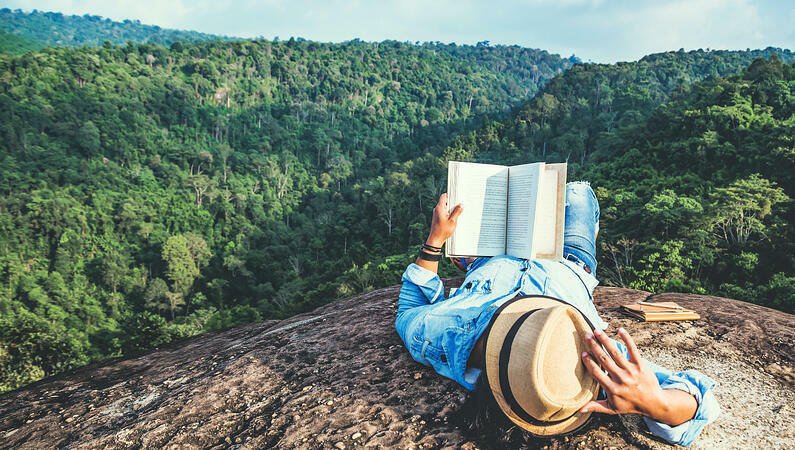 That’s why, whether you’re gearing up for a big trip or filling your wanderlust between adventures, books that tell stories from around the world are the perfect motivation for language learning. With that in mind, we’ve rounded up 10 language-filled, culturally diverse books to keep your bookshelves stocked with instant inspiration. This autobiography will speak to the soul of any language lover. Lahiri falls in love with the Italian language, but struggles to reach that magic place of fluency where she can write, read, and fully express herself in another language. So, she packs up and moves her family to Italy to immerse herself in the language and culture. This book, originally written in Italian, tracks her journey deep into the Italian language and all that happens along the way. This novel takes us to Rio, Brazil for a fast-paced, intriguing adventure in which an American translator chases after a notoriously unpredictable Brazilian writer who has disappeared. Through the twists and turns of her pursuits, the main character finds adventure, love, and lots of hidden mystery between their two distinct languages. If you believe in the magical powers of language learning (and translating! ), this one’s for you. In this collection of stories, Szalay holds a magnifying glass up to the lives of nine European men living in countries that are not their own. Through a brutally honest lens, we follow these characters as they navigate important moments every world traveler will recognize: the vulnerability of speaking a second language, the learning curve of a new culture, and the moments of insecurity that all humans experience. A literary classic, A Clockwork Orange is an unsettling, intriguing read for anyone fascinated with the trappings of linguistics. Set in a future world, the main character, Alex, speaks in an invented language with notes of English and Russian, narrating their sprees of criminal activity. Examining the role of language in understanding good versus evil, fans of dystopian literature shouldn’t miss A Clockwork Orange. Umami transports readers to a single building complex in Mexico City, where multiple voices are woven together to tell the stories of its residents. Diverse in age, circumstance, and even language — each perspective contributes to a larger tale of the love, loss, and family experiences that define this community. Translated by Sophie Hughes, this is a great choice for a bilingual reader who speaks both Spanish and English — try your hand at both versions! If your dreams are filled with visions of the cave temples and tropical seas of Sri Lanka, then this book is for you. Known for his innate ability to wax poetic about some of the world’s most fascinating destinations, Gimlette takes us this time to the often misunderstood Sri Lanka to give readers a deeper understanding of the culture, context, and wonder to be found on this Indian Ocean island. Get to know modern Indian-American life through the eyes of a rising Bollywood star. For fiction lovers who take their cultural immersion with a dose of drama, this book (and any novel by Dev!) drops you directly into the family affairs, friendship woes, and perils of fame that define main character Ria Parkar’s complex life in the spotlight. In this moving memoir, Nafisi takes readers inside the lives of women living in revolutionary Iran, where they are forbidden from reading Western classics. When Nafisi takes it upon herself to gather a group of young students, they explore the works that have a lasting impact on their enlightenment and freedom. Get a glimpse into the ideas, dreams, and boldness that stem from Nafisi’s courageous act of defiance. For those who find as much comfort in reading as they do cooking, get yourself a copy of The Indian Cooking Course. Learn about regional nuances, specialties, and Indian culture through the lens of different culinary traditions. With vivid imagery and beautifully intertwined historical insights, you can explore India from the comforts of your own kitchen. A literary classic, Things Fall Apart takes readers to an Igbo village in Nigeria and offers a compelling viewpoint of the modern African experience. The novel follows two storylines that overlap in illuminating ways — exploring the cultural realities of colonization, the traditions of Igbo, and the overarching human experiences that connect us all. Want an even more intimate reading of Things Fall Apart? Start learning conversational Igbo with Mango’s language and culture course. Now that you’ve traveled the world in books, it’s time to get ready for your next adventure. With over 70 world languages and dialects to choose from, take your wanderlust on the road with language and culture training designed to prepare an adventurer like you for the experience of a lifetime. Start learning now! What types of literature inspire you? Share with us the stories that have most impacted your life in the comments below!